I love Sunday mornings. My bio-clock doesn't allow me to wake up late (unless of course got cheong session the night before *coughcough*). When the sun is up, I am up which explains why I sleep with the curtains opened. Sunday morning is a time where the whole place is quiet. People sleeping in on their day of rest. No cars on the street meaning no traffic, meaning no blaring horns that the trigger-happy Taobaolanders are so fond of. Factories are done for the week and so are the construction going on in the neighbourhood. So anyway, I decided to whip up something from the kitchen for a kick-back style breakfast. 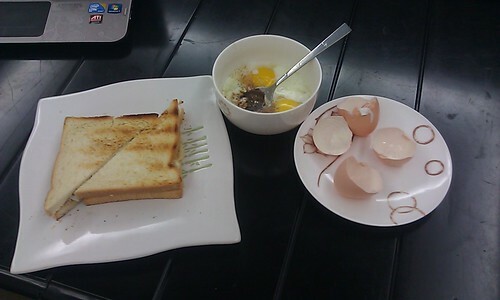 Egg tuna mayo on toast and a couple of half-boiled eggs. As I slowly eat, my laptop is playing an episode of 楚留香 drama circa 1979. I have been chasing these old Hong Kong serials of late. Perhaps, it is a way for me to catch up on missed childhood as I wasn't allowed to watch TV during my Primary and Secondary School days. I still remember the agony of listening to my classmates talked about the shows the night before and I haven't a clue. So anyway, I am 6 episodes away from completing this serial which I supposed will be done by today. Next on my To-Watch list. 银剑杀手沈胜衣. Also circa 1979. My bed time back then was 9PM but even before that the TV was off-limits on school nights.